On May 22, we are hosting our first D’Youville Conference on Teaching Innovation. The event will be focused on six major concerns: exemplary pedagogy, technology-infused instruction, outcome-based assessment, inclusive strategies, research and scholarship, and faculty wellness. The morning will take place in the Kavinoky Theater and will feature our “Classroom Moments” series, short story-style talks about Aha! classroom moments that made our speakers pause. After lunch, attendees will get a chance to select from a list of active workshop sessions. We are still looking for a few more morning speakers who might have one or a few classroom moments to share. 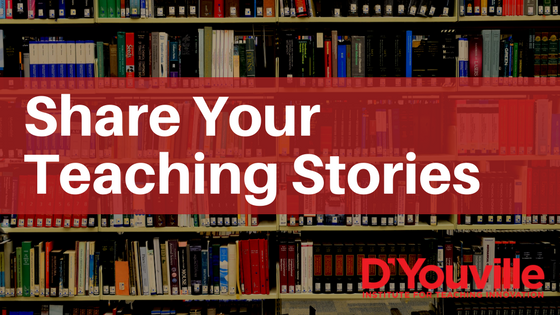 Your talk only need be 5-10 minutes and should feature a story, as well as a lesson learned about the way you approach teaching. If you are interested, please send a photo for our Web page, a talk title, and a 1 or 2-line description of what your talk will be about to macviel@dyc.edu no later than April 6. Please know that we are grateful for your consideration and let us know if you have any questions. In addition to presenting, there is always an opportunity to share your story via our ITI newsletters. You may have noticed the ITI newsletter is featuring a story each month on the great work going on in our classrooms. In some cases, I am invited to observe a class to take pictures and in other cases, faculty have sent me info. If you are working with our students in innovative ways, tell us about it! I am happy to come observe your class in order to help you share your story and you are also welcome to send me an article with photos to publish.